Get your FREE Sample issue of Fighting Spirit Magazine today! (1 Customer Reviews) | Write Review 12 issues per year FSM - Fighting Spirit Magazine is the UK's biggest magazine dedicated to wrestling. 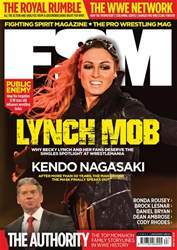 A powerful and exciting feature-led magazine, FSM provides wrestling fans with the highest-pagination monthly periodical and additional MMA coverage all at a great price. Also covering other forms of competition fighting including mixed martial arts and UFC, whilst also reviewing all relevant DVD and film releases, no other competition fighting magazine delivers more to the UK wrestling audience. Looking for Fighting Spirit Magazine in print? Unfortunately pocketmags.com does not sell print copies of Fighting Spirit Magazine, but all is not lost. Our partner at magazine.co.uk sells print subscriptions at the best prices online. All of this, plus our usual news, PPV and TV reports, and DVD and videogame reviews. This month's issue also includes Nick Aldis in the aftermath of All In, and what it took to get him to the point of putting over Cody Rhodes for the NWA title; Jim Cornette on how Twitter brings him all the worst in pro wrestling, but yet he still managed to find some great modern action this month; and live from Battle of Los Angeles, Rob Naylor describes why PWG still has the magic touch, no matter from where it emanates. FSM - Fighting Spirit Magazine is the UK's biggest magazine dedicated to wrestling. A powerful and exciting feature-led magazine, FSM provides wrestling fans with the highest-pagination monthly periodical and additional MMA coverage all at a great price. Also covering other forms of competition fighting including mixed martial arts and UFC, whilst also reviewing all relevant DVD and film releases, no other competition fighting magazine delivers more to the UK wrestling audience. You'll receive 12 issues during a 1 year Fighting Spirit Magazine magazine subscription. Solid app, works well on Nexus 7 - seamless magazine/subscription ordering and a free magazine within the price of the app. Needs to improve descriptions and contents of each issue, I expect this will improve in time. You'll receive 12 issues during a 1 year Fighting Spirit Magazine magazine print subscription.